Active Voice Lab is a nonprofit network of seasoned strategists, led by Ellen Schneider. We help funders, advocates, media makers, and other leaders skillfully and collaboratively use story to advance social change. Based in San Francisco, we work with allies in the U.S. and beyond. Financial support comes from foundation grants, fee-for-service/consulting, and private donations. Active Voice Lab grew out of Active Voice, a leader in developing effective, story-fueled impact campaigns to spur progressive action. We’re now focused on big picture strategies and initiatives (see The Future of Public), so if you’re in search of an impact producer, please visit the Fledgling Fund or, if your project is funded, contact us for a referral. While many social change movements share goals, each movements’ cultures, tools, and expectations vary widely, as do the power dynamics among communities. Effective collaboration is particularly complex when “creatives” are part of the mix: shifting narratives, editorial control, and even content ownership are new concepts to many within the ecosystem. We draw partners together across different parts of this ecosystem with a focus on social, economic, and racial equity. Today’s social movements need powerful stories as much as they need leadership, policy research, grassroots organizing, funding, and other fuels. And while story-based media can be a potent tool for change, it’s not enough. In our experience, real change comes only when interested sectors work together, each bringing to the table what they do best. Some have cutting-edge information, some have trusted relationships with grassroots networks, some have access to policy arenas. And some — the storytellers — have the ability to engage people with compelling narratives. Active Voice Lab has built a network of prolific filmmakers, production studios, major foundations, policymakers, community leaders, and film distributors who share our dedication and passion. 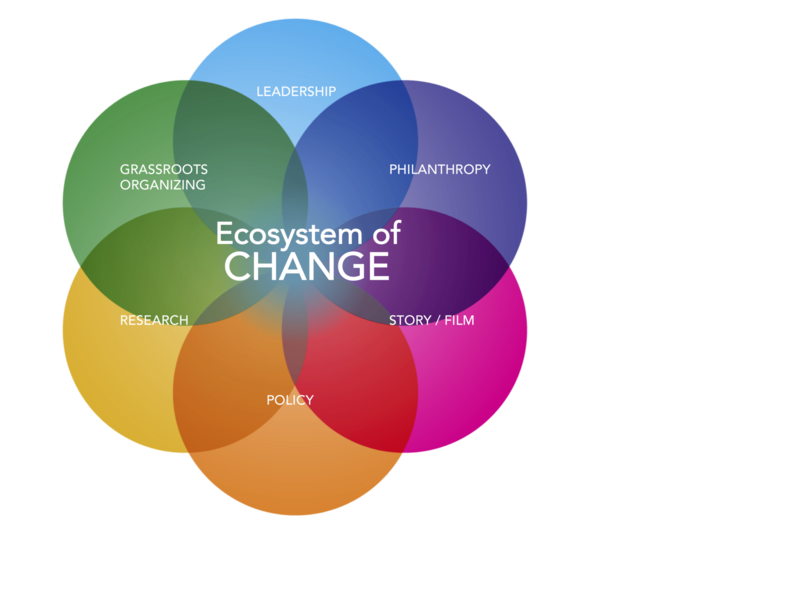 Serving as an intermediary between these allies, we work with all the agents in this “ecosystem of change” to help them think strategically about how to use storytelling to achieve sustained impact. We have an enduring belief in the power of a story well-told to bring together people of differing perspectives, help them push past ideological or experiential divides, and spark greater collaboration to tackle pressing social issues. Learn more about how we applied the ecosystem of change framework to Active Voice Lab’s innovative multi-year project, Shelbyville Multimedia. Our strategies are designed to reach beyond the choir. One of the few things that Americans seem to agree on these days is that polarization is tearing this country apart. People get their information from and share their opinions on increasingly fragmented media platforms, reinforcing deeply held beliefs. Tweet-able slogans, sound bites and a 24/7 news cycle have further reduced complex situations into simplistic good vs. bad caricatures. Nuanced, character-driven storytelling is an antidote to polarization because it can advance empathy and critical thinking. That’s why Active Voice Lab supports strategies that tap into values and themes that can engage a broad range of audiences “beyond the choir.” Applied to popular culture, journalism, documentaries and digital platforms, our tools encourage a diverse public to reflect, to express clear, informed opinions, and, importantly, to address the systems that perpetuate inequality. A 2010 report on our “beyond the choir” framework explains this values-based thinking in action, as a tool for both identifying campaign target audiences, and for assessing impact. HOW WE WORK: DIG. BUILD. SHARE. We serve the broader ecosystem through a pragmatic and structured approach. Active Voice Lab projects progress through three interlocking stages: We dig for answers, we build tools based on the challenges we discover, and we share those tools with our partners to help them optimize their use of media. Our research identifies examples of effective collaboration. Our methods incorporate the underlying principles of story-based communications. Our tools create specific mechanisms for action. For example, throughout 2014-15 we applied our expertise to the growing field of media impact measurement. We were intrigued (or, more accurately, concerned) to see that media “evaluation” was becoming synonymous with big data—a belief that the major value of storytelling was best measured in clicks, forwards, and keywords. Tallying these is surely important for many projects, but social media-oriented measures are simply insufficient data points for determining all the varied outcomes to which stories can contribute. Dig. In How Do We Know focus groups around the country, we asked these tough, fundamental questions: What can, and should, be measured when it comes to creative work? Collectively and individually, how do we know if we’re making a difference? How does an increased interest in metrics influence the creative process? Not unexpectedly, we found a broad range of perspectives among creatives and funders that were all over the map. To intensify our research, we created the How Do We Know network and realized that there are too few opportunities for constructive discussion about the sensitive issues of measurement and value—not to mention the stark power imbalances between funders, creatives, evaluators and advocates. For example, few media makers feel that they can afford to talk to their funders about what didn’t go as expected with their project. Organizations that use media are often reluctant to level with creative content providers about the terms of their informal partnerships. Build. We developed a beta version of How Do We Know, a resource designed to help those in our ecosystem make sense of the vast array of tools and methodologies that have emerged in the past few years. 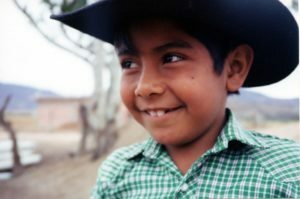 We continue to view our work helping funders and creatives understand each other’s perspectives as a unique contribution, particularly regarding the push for—and consequences of—measuring impact. Share. We launched How Do We Know (initially as an independent website), along with a series of in-person conversations, workshops, and online exchanges to flip the conventional script. We wanted to understand measurement as an opportunity to learn how creative content can contribute to social change, rather than as a top-down, numerical judgment of effectiveness. As “metrics mania” dominates the discourse around the impact of storytelling, we want to make sure to flesh out additional important dimensions and include them in the assessment process. Active Voice Lab was created in 2008 as the innovation unit within Active Voice, an organization founded to use film to “put a human face on public policy.” Housed jointly in San Francisco, Active Voice and Active Voice Lab offered field-wide leadership and served a broad range of media makers and allies. For 15 entrepreneurial years, we designed and launched campaigns (see the Active Voice campaign archive), developed mixed-method assessments, shared our best practices with the field, and extolled the values of using character-based, mostly independently-produced, story-centric media in a range of settings. 1994–1996: COULD A BROADCAST-BASED STRATEGY SHIFT PERCEPTIONS AND INFLUENCE POLICY? The roots of AV Lab’s interest in reframing evaluation begin at the PBS series P.O.V., where then-executive director Ellen Schneider commissions an assessment of “Getting to The Heart of the Matter” based on the film by Gini Reticker and Amber Holibaugh. Results of this and subsequent inquiries are featured at Communications Network (1995) and the “Docs that Rock: Can Nonfiction Films Have an Impact Beyond Exhibition” panel at the Sundance Film Festival (1997); in the Benton Foundation’s publication “Making Television Matter”(1999), funded by the MacArthur Foundation, and in Nieman Reports (2001). 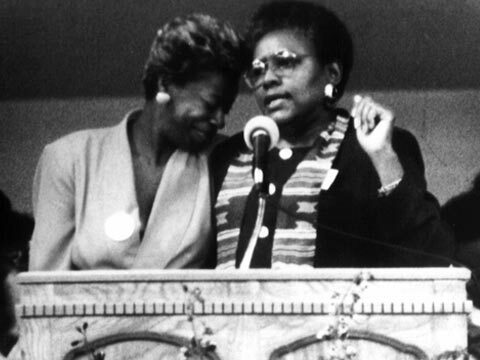 1999–2008: COULD STORIES ABOUT RACE, CULTURE, AND IDENTITY BRING PEOPLE TOGETHER? Active Voice conducts internal developmental evaluations and mixed-method qualitative outcomes assessments with NGO and grassroots partners for several film projects in order to improve AV’s practices and to assess how well film campaigns meet their objectives. Projects include: Chasing Freedom (2004), A Doula Story (2005), King Corn (2007), and Food, Inc. (2008). 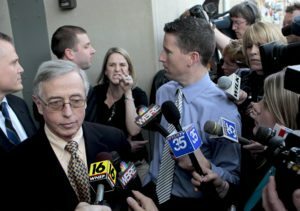 2008–2009: CAN GRANT MAKERS AND MEDIA MAKERS UNDERSTAND EACH OTHER BETTER? WHY SHOULD THEY? AV Lab’s off-the-record listening tour reveals that a lack of communication, particularly between media makers and funders, is resulting in unrealistic expectations of outcomes, compromised productions, legal intervention, or worse. The Prenups: What Funders and Filmmakers Should Talk About Before they Tie the Knot eventually becomes required reading by media funders, is included in film school curricula, and is used by international edutainment groups, etc. Funded by Haas Charitable Trusts (now part of the Wyncote Foundation). 2011–2012: HOW DO PARTNERS USE CREATIVE MEDIA TO ADVANCE THEIR CAUSE “BEYOND THE CHOIR”? WHAT MAKES A GOOD PARTNER? Using pre-/post-surveys, focus groups, and opinion leader interviews, AV Lab’s Story & Policy initiative tracks the influence of three social issue films—Welcome to Shelbyville (2011, Rake), clips from Gaining Ground (2013, Trellis), and clips from Kids for Cash (2013, Trowel)—in select communities, through a grant from the MacArthur Foundation. Simultaneously, Community Science conducts a mixed-method evaluation of the ecosystem of change model applied to each film. Sobering reports from the Community Science team spur mid-course corrections (some partners were not as specific about their local objectives as we’d thought). AV’s Executive Director, Shaady Salehi, hires our first full-time, in-house evaluator, Dina de Veer. AV staff is trained in the relationship between programs and evaluation, and all campaigns are designed with clearly defined goals from the outset. AV starts providing tailored, media maker-friendly evaluation services for a range of films that will include Fixing the Future, American Promise, and Gideon’s Army. 2013–2014: WHAT ARE THE IMPACTS OF MEASURING IMPACT, ESPECIALLY ON THE CREATIVE COMMUNITY? 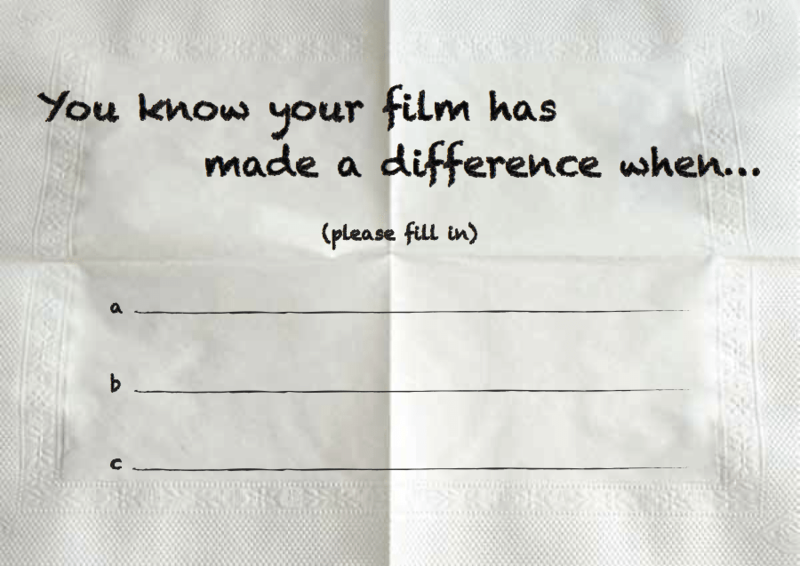 AV Lab starts informal conversations at the Sundance Film Festival by handing out postcards and initiating one-on-one follow-up conversations with individual media makers and grant makers. Using the research technique that helped us create The Prenups, and with support from Ford Foundation, AV Lab convenes focus groups with creatives about how the increased attention on measurable outcomes is affecting their work. Hosts/allies include the Tribeca Film Institute in New York, the International Documentary Association in LA, and the San Francisco Film Society. AV Lab introduces a draft of the Horticulture framework to focus groups and makes key adjustments based on early feedback. Simultaneously, conversations with arts and media grantmakers lead to a funders “How Do We Know” roundtable co-sponsored by the William and Flora Hewlett Foundation, featuring members of HDWK/Learn. Several participants sign on as HDWK/Philanthropy advisors. A grant from the Nathan Cummings Foundation for AV Lab’s ACTivate initiative enables a mixed-method evaluation of Active Voice’s community campaign around Participant Media’s film A Place at the Table. A blue ribbon working group of leading social scientists and media analysts provides steady consultation and external oversight (at the invitation of the Aspen Institute, the entire process was shared at the American Evaluation Association’s conference in 2014). Filmmaker Kristi Jacobs joins HDWK/Creative. AV Lab assembles the How Do We Know (HDWK) network of advisors to create a cross-sector research and learning community. We test our ideas at funders’ gatherings, film festivals, and an impact research conference for game-based learning. With support from the Compton Foundation, HowDoWeKnow.net is developed (thanks, See3) to reframe the means and methods of evaluation and suggest new collaborative tools, such as Horticulture. 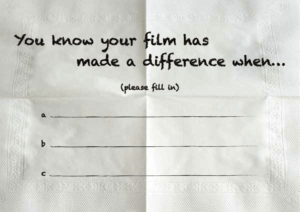 2015–2017: HOW DO WE KNOW (IF WE’RE MAKING A DIFFERENCE)? In January 2015, Active Voice formalized our name as Active Voice Lab and transitioned to focus exclusively on prioritized learning, field-building, and support for sector-level research. We phased out film-based campaigns and were gratified to see that embers of the growing field of “impact producers”—as well as media makers themselves—adopted many of the campaign engagement models that Active Voice developed. 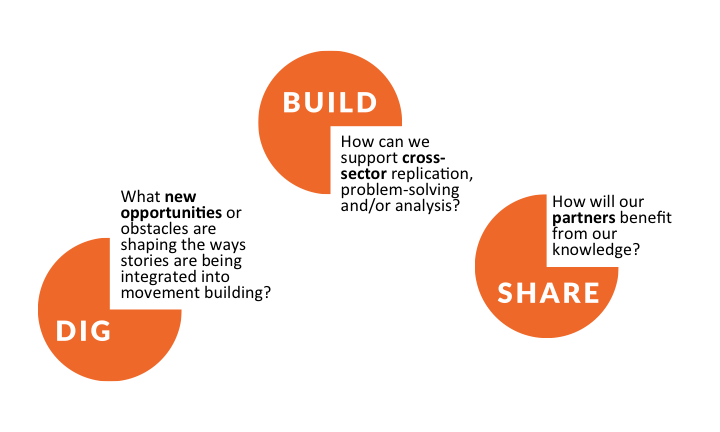 By 2016, with the support of the How Do We Know network, Active Voice Lab turned towards the collective “platform-neutral” questions of the field: What strategies are emerging? How can we talk about what doesn’t work so well? How do we refocus “metrics mania”-style evaluation to foster creativity and effectiveness? The opportunity to listen, instead of sell, has been transformative. We have critically assessed our portfolio and have either improved or discarded methods that no longer meet the needs of ecosystem players.